what i make is soup. i like a wet bath of vegetables in flavorful water. but i also went hard on the vegetable content. a vat of thickfreakness for my freakin' face. although possibly not after a batch of way too burly tacos. if overdoing it is a good thing, then i'm the best. 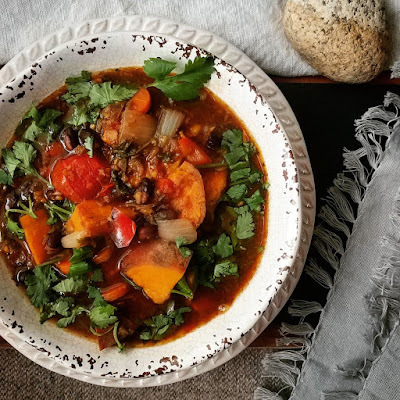 SWEE'POTATO BLACKBEAN RED LENTIL SOUP! and half a can of black beans WITH that sopa in there. THAT is a lot of good stuff to be messin' with. i also added a little cayenne and some jalapeno pepper, too. like i told you, it's a little spicy. by which all future soups will be compared. i know you see those cilantro sprankles on top. that's just how i do things, dudes. to all the extremities of your physical and metaphysical soul, bro. i had the day off, but i now i think i have the day ON. and at the Folk Life & Liberty Fortress. of course, it's a damned cold and snow-covered slippery mess of a day, too. and it's my friend shawn's berfday, too. so happy berfday to him, for sure. and i wish i had the kind of brain that didn't remember those things. like the thread counts of different napkins or whatever. it's a passive action that's constantly ongoing in the way back of my processor. i can't remember all sorts of things these days. maybe i'm just aging, maybe it's something more sinister, i really don't know. and those fatty-bonding adaptogens and so on. that stuff can regrow brain cells. it can't regrow memories, obvi, but it makes more room for new ones, probably. i'm not a nutrition-based neuropathologist or anything. maybe there will be space for something better than birthdays. i repeat myself when i'm feeling down. of him catching the tab for a change. i know his assessment was definitely working in his favor. i'm saying that my recollection is as selective as my collections. but i know what day somebody i haven't spoken to in years was born. what's important to one person isn't necessarily actually important to anybody else. heck, most of what i know isn't even actually important to me. but it's in there, for better or worse, whether i try to hold onto it or let it go.